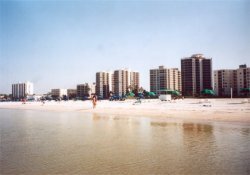 Relax and soak up the rays on beautiful Ft. Myers beach by day and enjoy spectacular sunsets by night! 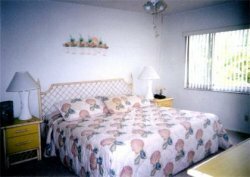 This true islanders beachfront condo is one level & located on the first floor for your convenience. 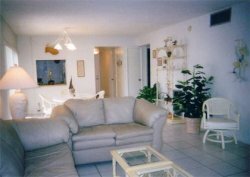 This condo features an open-air floor plan, tropical decor w/tile & berber carpet throughout along w/screened lanai. Located in a private, secured & well maintained complex, this unit is very nice & quiet away from the congested area near the bridge. 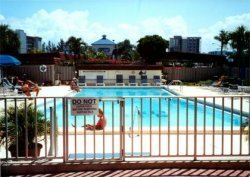 Conveniently located across the street from Santini Plaza which features a drug store, liquor store, post office, bank, 8 restaurants, shops, marina, and a trolley shuttle service to transport you all over our tropical island. Publix supermarket less than 2 miles away. Walking distance to golf course, movie theatre, churches, etc. Next door to a Holiday Inn that features live music & a tiki bar.